As the one-man Heat-1X rocket started to veer off course and outside the designated launch area, mission controllers cut the engine and ended the test flight well short of the 15-kilometer goal. Also, the parachute did not fully open. Success! 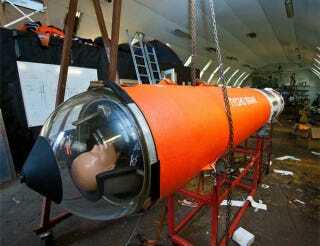 Indeed, the test was considered a success by designers at Copenhagen Suborbitals, who assembled the one-man vessel with £42,000 and spare parts (e.g. hairdryer for a heater) over the past few years. "We're going from talking about it and building and testing to actually flying something, so in that sense it's a big success," said Copenhagen Subobrbitals rep Kristian von Bengtsen in an interview with New Scientist.